BALI SUBMARINE - ODYSSEY : Rock Bottom Price ! 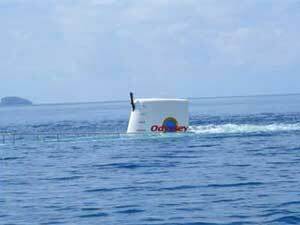 Odyssey Submarine Bali Design and built exclusively by a subsidiary of world leader in underwater technology, International Submarine Engineering Ltd. of Vancouver, Canada, the Odyssey II submarine are built to comply with stricter rules. The Odyssey II submarine is positively supported and held under water by powerful vertical thrusters. In case of power failure, the only submarine to surface. For added security, all systems are duplicated and all safety procedures can be performed manually. 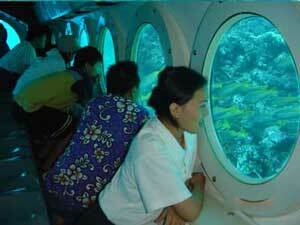 Submarine Safaris Asia, Ltd is launching a fleet of submarines in the world to visit the city, a tourist submarine. Once the private domain of scientists and divers as Jacques Cousteau, the underwater world of exotic species can now be experienced by people of all ages and fitness in a safe and comfortable environment. Calling all professional divers from the most timid can not swim, sightseeing submarine that will attract people from all walks of life. The battery so that you pose a threat to the fragile ! marine environment, underwater excursion craft can carry 36 passengers in air-conditioned comfort to depths as great as 150 feet. You will be able to watch and see the fantasy of rarely visited barriers and wide variety of colorful sea creatures in the famous dive site in Bali. Security is guaranteed in this highly sophisticated vessel, your voyage to the bottom of the sea will be smooth and effortless, as a pilot and co-pilot in an adventure that will stay with you forever. 10:00 am - 10:30 am : Check in, Briefing and Safety Procedure, Weight Measure, Life Jacket. 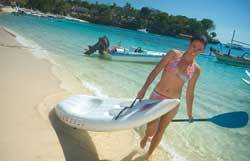 BALI SEAWALKER : Best Deal ! 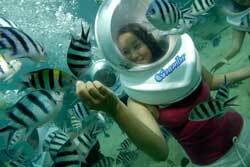 Bali Seawalker, Have you ever tried to walk on the ocean floor?. 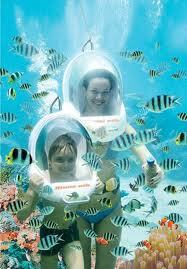 Seawalker Bali offers unique activities, walking on the ocean floor located in the Sanur beach. Live the adventure and unforgettable walk to the sea and enjoy the beautiful underwater environment with a special helmet that allows you to breathe under water as usual. This headset is specially designed special safety clothing and very comfortable, and children over 9 years with a minimum height of 130 cm is possible to wear a helmet. A safe and exciting underwater Walker Sea Adventure is a unique diving, offering the opportunity to observe the underwater world at a depth of 15 feet without certification and without wet hair. 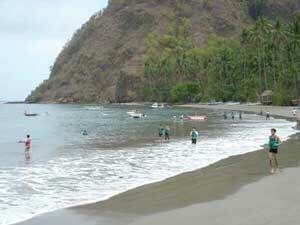 Participants marched on the bottom rather than swim while numerous exotic fish and marine life around them. Participants will have 30 minutes of real time underwater to a depth of 15 feet. 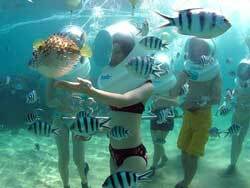 A large window in full-face helmet offers a close view of incredible creatures Seawalker directly under the Wed You join an exciting vacation the most memorable Bali Wed Walker is on the beach of Sanur. Guest with heart or lung problems, on medication, pregnant, with asthma or other respiratory ailments cannot dive. 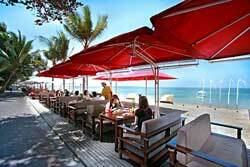 Guest with specific needs can also enjoy Bali Marine Walk as long as they can use both of their hands. Please contact us before make the reservation. After change into your swimsuit, then we going to Seawalker station by riding the transfer boat, it's only take 30 minutes from Sanur beach. 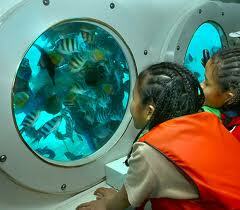 The instructor will help you go down the stairs to the bottom of the sea while seeing the wild fish surrounding you. BALI HAI CRUISES : Best Deal ! 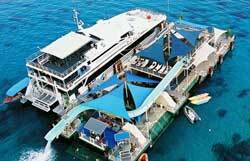 Bali Hai Cruise is a leading marine tourism in Bali. 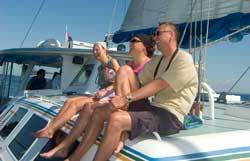 Bali Hai Cruises, operates cruises exciting day and evening from a private collection in Benoa Harbour, Bali. Aboard a fleet of luxury, modern boats in Bali, experienced crew provides friendly and professional and the best combination of Indonesian and Western hospitality. Bali Hai Cruise sail to Nusa Lembongan Island, satelite island of Bali, which is located 20 km off the east coast of Bali, which is known as the "Three Island region." The island is about 4 km long and 2 km wide and has about 4000 inhabitants. Nusa Lembongan and its sister islands, Nusa Penida and Ceningan are surrounded by crystal clear waters and spectacular coral reef making it ideal for diving. Besides tourism, the main industry is the agriculture algae. the algae are grown, harvested and then exported worldwide for use in cosmetics, food stabilizers and medicines. Other sources of income include traditional wooden boat building, farming peanuts, crops sweet potato and fish. You can have a sample of this during the tour of the village. BALI HAI CRUISES PROGRAM : BEST DEAL OFFER ! BEACH CLUB CRUISE: IDR 1.410.000/PERSON. FOR SPECIAL DISCOUNT CLICK HERE ! 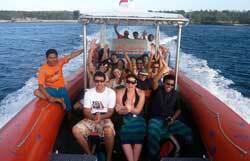 REEF CRUISE : IDR 1.410.000/PERSON. FOR SPECIAL DISCOUNT CLICK HERE ! ARISTOCAT - THE LUXURY SAILING CATAMARAN (NUSA LEONGAN) : IDR 1.475.000/PERSON. FOR SPECIAL DISCOUNT CLICK HERE ! 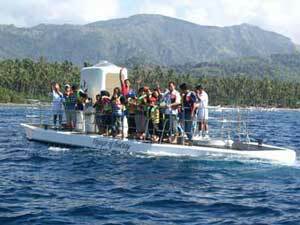 OCEAN RAFTING 3 ISLAND CRUISE : IDR 1.370.000/PERSON. FOR SPECIAL DISCOUNT CLICK HERE ! ARISTOCAT CASTAWAY CRUISE : IDR 1.545.000/PERSON. FOR SPECIAL DISCOUNTCLICK HERE ! 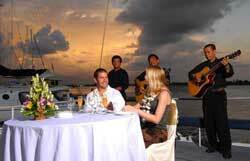 DINNER CRUISE : IDR 805.000/PERSON. FOR SPECIAL DISCOUNT CLICK HERE ! ARISTOCAT EVENING DINNER CRUISE : IDR 1.005.000/PERSON. FOR SPECIAL DISCOUNTCLICK HERE !